The last few years, my friends and I have gotten together sometime around Thanksgiving to have our own Friendsgiving. I’ve never been a great cook, so creating the decor has been my task, and I do a lot of the Thanksgiving papercraft with my Cricut Explore. I don’t remember why it started, but I now look forward to it from 12:00 AM November 1st until whenever we have it. Back when I still had the old Cricut Expression, I bought the Tablescapes Fall & Winter cartridge just for our table decor. Nowadays, they have a Thanksgiving Table Décor Digital Set that you can download. With Design Space, you can also easily import SVGs and other images, which is what I did last year. Rachel had just moved with her family into their new home and she called dibs on having our annual party at her place. She hosted her extended family for a party the day before ours, so her house was already set up with ample left overs we could appropriate, borrowed tables and chairs, and cleaned. Since this was the first Friendsgiving at Rachel’s new house, I decided to shell out some extra cash and buy the Give Thanks SVG Kit from SVGcuts.com. 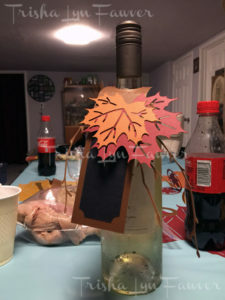 For $6.99 the kit comes with files for a pumpkin marquee sign, turkey napkin holder, wine glass tags, wine bottle labels, branches for a vase, and table leaves. 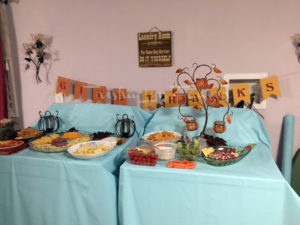 I added to our holiday decor with a Give Thanks banner and similar leaf place cards. If I had known that the only color of table covering that Rachel’s parents could find left at the store was this weird teal blue, I may have picked a different theme than fall leaves. But hey, my decor really popped against the blue background! SVGcuts.com recommended some papers that they used for their demo items, but I just stuck with some textured fall leaf colored papers I picked up from Michael’s. I did my best with a trip to Party City to find napkins, paper plates, utensils, and cups that would match. They’d been pretty much picked clean so close to Thanksgiving, so I had to make due and picked out cream cups and gold utensils to best match the plates and napkins I was able to find enough of. I went back to that old Tablescapes Fall & Winter cartridge for the leaf napkin rings. When I used to have to rely on the cartridge only, it always required a couple of test cuts to get the napkin rings the right length. The beauty of the cloud-based Cricut Design Space program that debuted with the new Explore machine is that I can save old projects and open them up later. So of course, after more test cuts last year I was able to save the perfect sizes for everything, so this year will be a breeze! I wasn’t in charge of bringing the wine, so I made the wine tags without anything on them in terms of what kind of wine Katie would be bringing. I think my intention might have been to use a metallic pen and write it on that day. However, there was a snafu with needing ice, Jennie cancelled coming at the last minute due to the family being sick, and we then needed mashed potatoes STAT, so dinner got started later than expected and by that time, writing on the wine label didn’t seem so important. 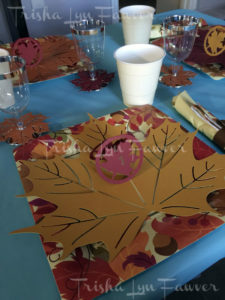 Between the papers and the SVG kit, excluding the plates, cups, napkins, and utensils, I spent under $10 to really give out Friendsgiving table an elegant touch with these easy Thanksgiving papercraft projects. I encourage you to think outside the box with your paper choices and make your Thanksgiving table truly unique without breaking the bank. Do me a favor though – go to your local party place early so your table cloths will match your decor better!